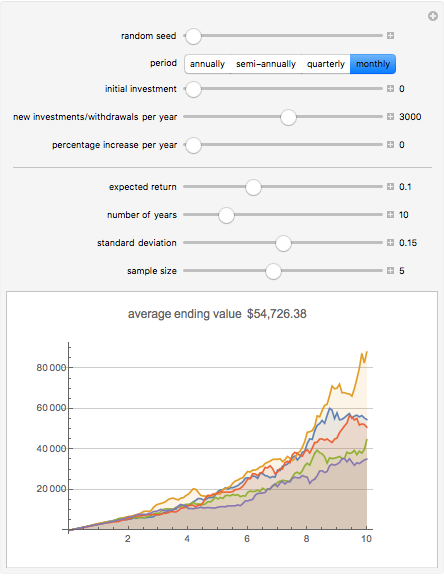 Investment returns from regular savings with random performance. The average ending value is of the random sample used, not an overall expected value. Returns are expected to be distributed log-normally around the expected return. Withdrawal questions can be addressed by using a negative annual investment. The increase amount per year parameter can track savings rising with income, or cost-of-living adjustments on withdrawals. All parameters should be annualized figures. Period should be the frequency of new savings or withdrawals. Adjusting the sample size to a new figure and back will generate a new set of random returns. Test proposed withdrawal rates for a low chance of depleting capital by watching the lowest series in a large sample. The savings rate and time do most of the work. Increase either to reach a set goal. Typical expected returns for cash equivalents can be set to 5%, or the prevailing short-term interest rate. Typical expected returns for bonds can be set at 6 to 7%, or at the prevailing interest rate on long-term corporates. Typical expected returns for stocks can be set to 10%, or at dividend yield plus nominal economic growth. Typical standard deviation for cash equivalents can be set to 0, or 1 to 2% for short-term bonds. Typical standard deviation for bonds can be set to 4 to 5%, or the approximate bond portfolio duration. Typical standard deviation for stocks can be set to 15%, or 20% for riskier asset classes. Snapshot 1: Typical return of a one-time bond fund investment over 10 years. 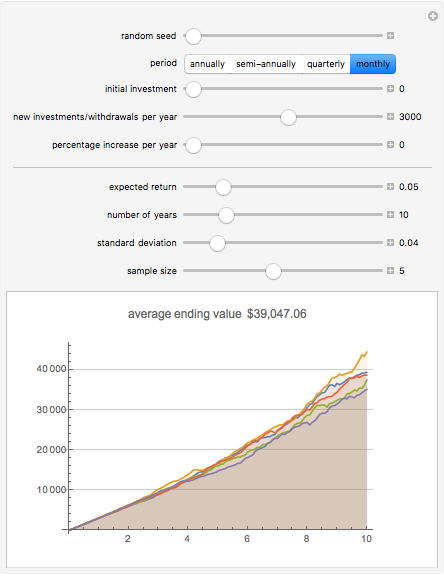 Snapshot 2: Regular savings of $3000 per year invested in a bond fund; 5% expected with 4% standard deviation. 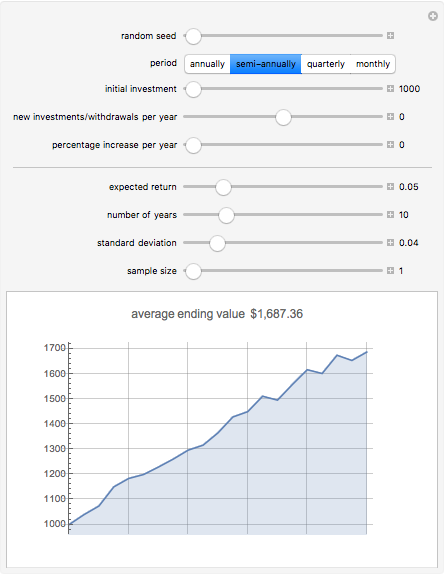 Snapshot 3: The same savings into a stock fund with 10% expected, but 15% standard deviation. Snapshot 4: 20 years of savings in a balanced portfolio, 8% expected and 10% standard deviation. Snapshot 5: 20 year balanced with 3% annual increases in the amount saved and a $5000 initial investment. Snapshot 6: Regular withdrawals equal to the expected return frequently result in a large fall in capital. Snapshot 7: Taking less than the full expected return lowers risk and can readily handle a long series of rising payouts.